Sitting on our flight out of Naples, we read in the in-flight newspaper that in the past week, approximately 1500 minor criminals had been released into Naples due to overcrowded prisons. Ahhh… that explains a LOT about our time in Naples. Ignorance is bliss! Had we known this before we arrived in Naples, our stay may have been one filled with anxiety and fear. 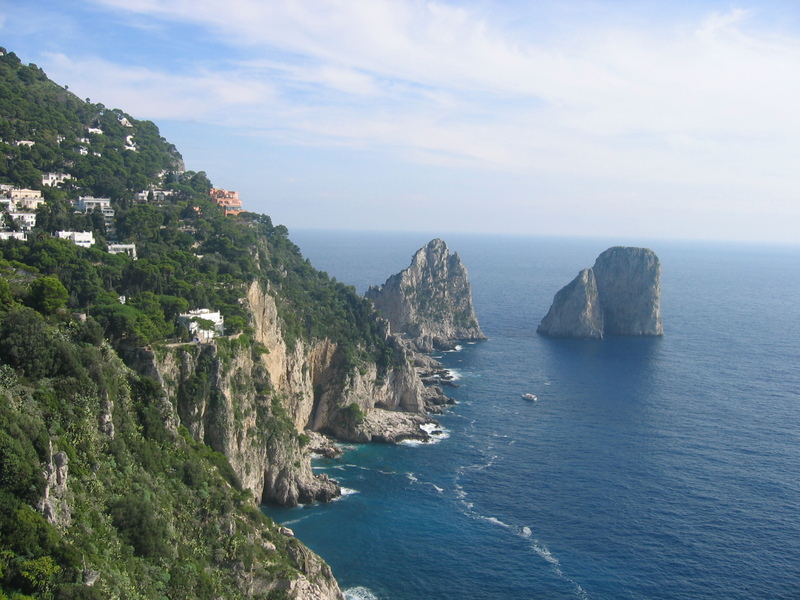 Instead, Naples to us at the time, was just a base to visit Pompeii and Capri. Admittedly, Naples was a little on the unusual side – we walked the streets and it was deserted, we searched for an internet cafe and were advised that it was best if we didn’t go there. We saw garbage bags being thrown out onto the footpath from apartments that were 5-6 floors up, right out the window and onto the footpath behind us. We only managed to escape ending up wearing all the rubbish. But, that aside we were able to visit Capri and Pompeii which made us happy. The ferry to Capri was pretty rough but the view upon arriving was worth it. We had a fabulous tour guide for the day, Fabio…. yes, can it be anymore cliche? The roads on Capri were no different to the mainland Italy. Tight, busy and as Fabio put it… “Mamma mia roads”. The following morning, we almost missed our day trip to Pompeii because we “snoozed” a few too many times. Fortunately we made it on the tour bus with only minutes to spare! 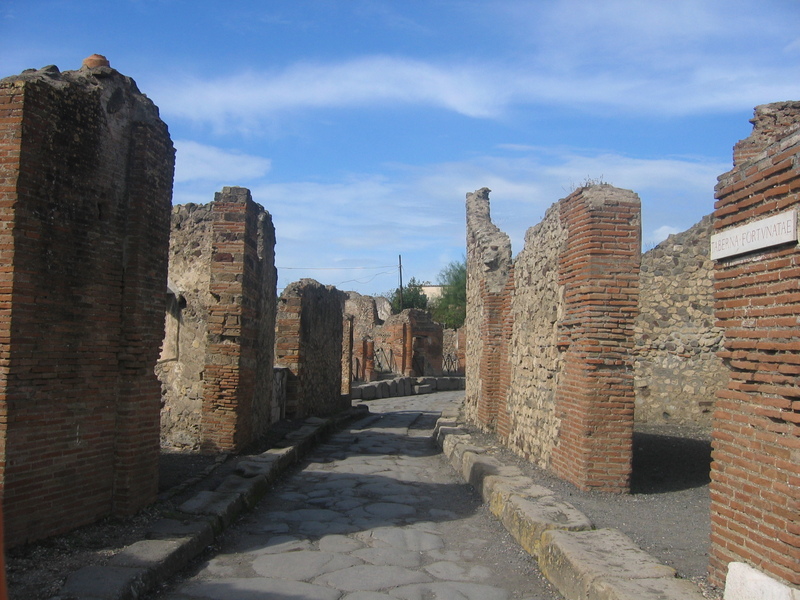 Pompeii was a little eerie but still very fascinating. We were so pleased to see Mount Vesuvius towering in the background. 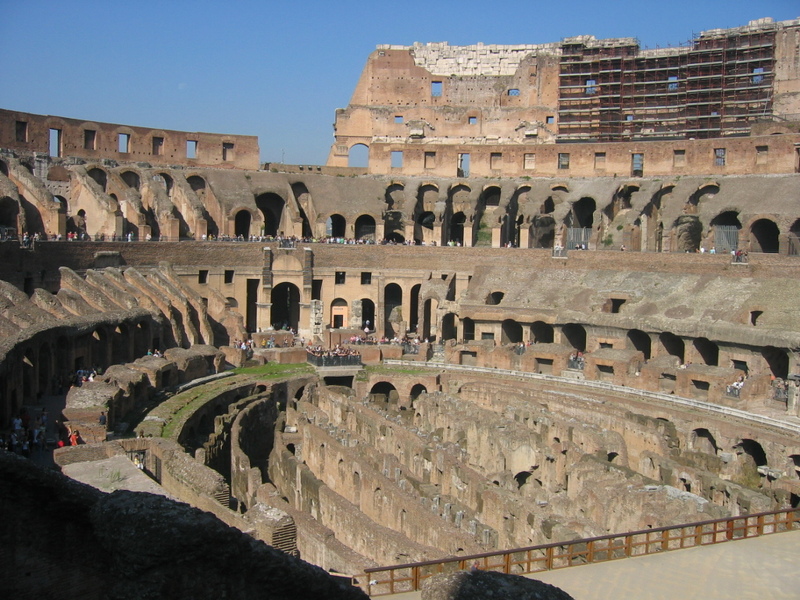 To think in 62AD, it erupted and covered the town in 6-8 metres of ash not lava. 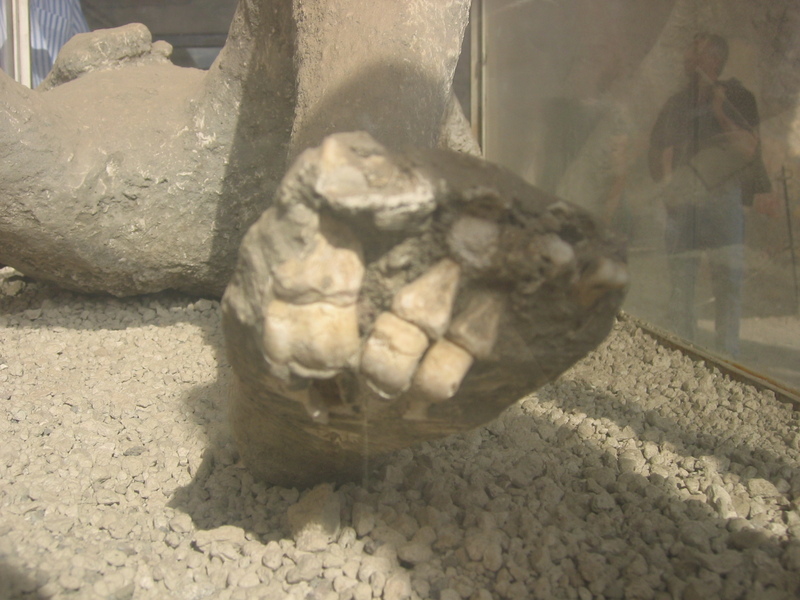 We saw plaster casts of 3 people who were found in the same position as they were when the ash covered the town. We saw city streets, shops and houses and artwork that still remained. Its quite extraordinary how intact and well preserved everything is. To finish up our time in Italy, we had a rather amusing cab trip to the airport. The car was overheating and the driver had to stop three times to cool the radiator down with water. We offered to pay him and flag down another cab, a little fearful that the car might catch fire. There was steam coming out the bonnet…. he insisted that he take us and as we arrived at the airport, we could the see on the dashboard, the little H for HOT flashing red. We couldn’t bundle ourselves out of the car fast enough and onto that plane to Barcelona. 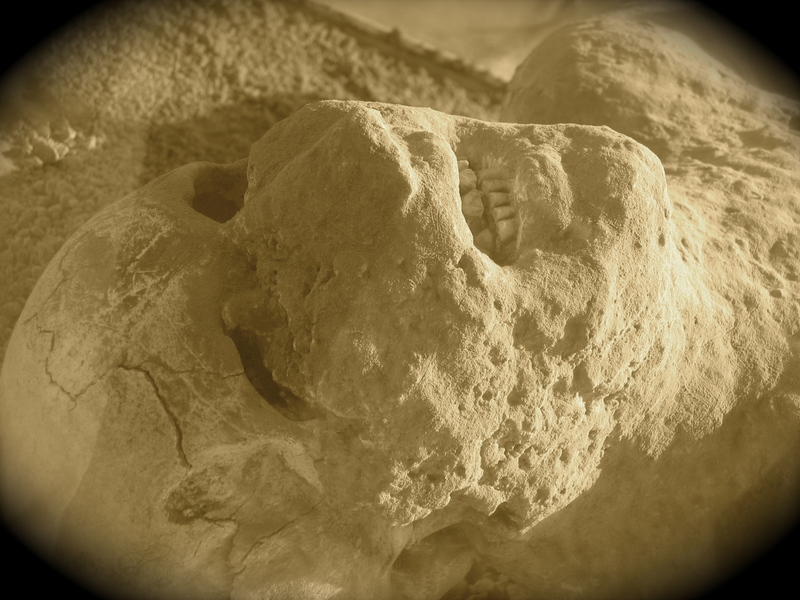 This entry was posted in Italy and tagged Capri, Italy, Mount Vesuvius, Naples, Pompeii, Rome. Every city is slightly different to the next. But in the same token, every major city have similarities. In all major cities, we like to just walk and walk. We have on our radar what it is we want to see and do but the best way to feel the energy of the city is to roam. And that’s what we did in Rome. So in our first day in Rome, we trekked to the Colosseum, the Roman Forum, Palatine Hill, Trevi Fountain, the Pantheon and the Spanish Steps. Roma is a-buzzing! People tell us crossing the roads in Rome is an ordeal, and it sure was. When crossing roads, we learnt very quickly, if we “latched” on behind a local, we would safely get across. And that worked every time! Another day, we spent roaming in and around Vatican City and the Sistine Chapel. Lining up for the Sistine Chapel probably took up most of the day. In fact, when we left the gates of the Vatican, according to our map, we weren’t too far from the Sistine Chapel. So we headed in the general direction to find the tail of a queue of people. Ignorantly, we jumped on the end. Fortunately for us, it wasn’t a queue for the bathroom or a taxi, it was in fact the entrance queue, that ended up snaking for over 1 km we estimated. We turned at least 3 corners before we saw the entrance! Phew, it was a lucky gamble we took jumping inline. And it was worth the wait! Classical Rome, you were full of surprises! Everything from all the variety of pastas we ate, to the street vendors, but most of all to the interesting pizzas that you serve! 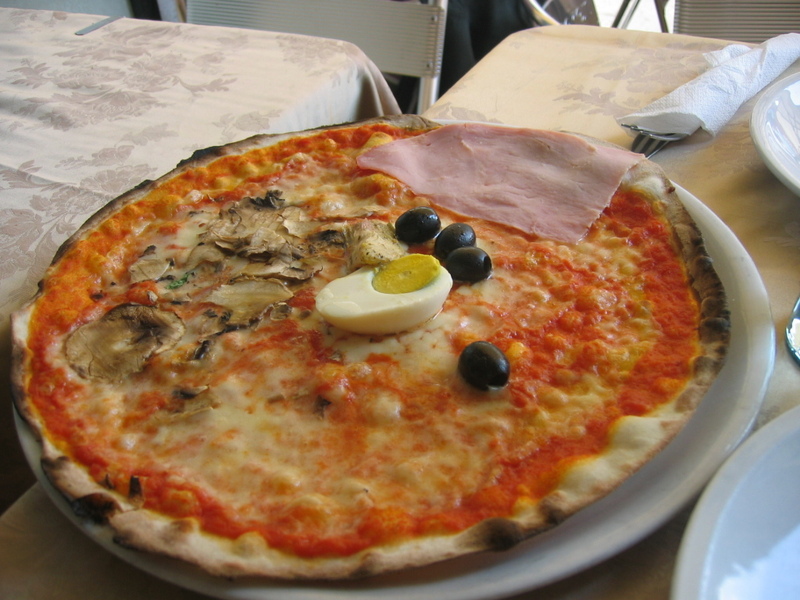 After a long day’s walk, we ordered a ham, mushroom, olive and egg pizza. And to our dismay and horror, this was what we were served…. Did someone order pizza with NO topping? What must Italians from Italy think when they see what Australians and Americans serve up as pizzas? Oh my! In all seriousness though, we are so pasta-ed out. Although, the food is divine here, we have eaten so much pasta: so much so that we cannot imagine eating it for months to come. Unlucky for us though as after our next stop, Malta, we are coming back for more of Southern Italy! This entry was posted in Italy and tagged Colosseum, Italy, Palatine Hill, Rome, Sistine Chapel, Spanish Steps, Trevi Fountain, Vatican City. Florence was a great spot to set up base for a few day to explore the surrounding areas. From Florence, we ventured to Pisa and Siena as day trips. The Leaning Tower of Pisa is in walking distance from the train station. Don’t listen to anyone who tells you otherwise. We met a couple on the way to Pisa who were bitterly disappointed that there was a bus strike in Pisa and that they would have to walk to see it. Because god-forbid anyone should ever have to use their legs for 10 minutes at a time! Being in Pisa was surreal, to stand on flat ground and look at this building that looks to be toppling over. There were many brave tourists venturing in to tour the tower. No thanks, we are pretty comfortable staying on a flat and stable surface! Around Italy, there are vendors selling fake everything. Any item from any designer brand that you can imagine, there is a fake being sold somewhere on the street: sunglasses, perfumes, handbags. One day in Florence, while we were enjoying a stroll through the streets, a piracy ring bust unravelled in front of our eyes (only metres away). First, we heard a “command” hollered from one of the vendors and within 10 seconds, all their temporary shop fronts were literally folded up. There were easily about 10 men carrying their makeshift stores and racing through the alleyways of Florence with undercover police in tow. Only remnants remained that there had been an illegal store nearby: nothing more that a few stray sunglasses lying on the footpath. One detective wearing a cream suit came racing around the corner and was visibly annoyed that the vendors had alluded him. He swore loudly and animatedly kicked and stomped on the scattered sunglasses. We stood in awe and for a split second, considered that this might have been a crime chase being shot in a movie and we would be in the midst of it! Italy was certainly having its share of excitement for us – what would be next? After spending a week in Florence and eating the BIGGEST gelato known to mankind we are here in Rome. 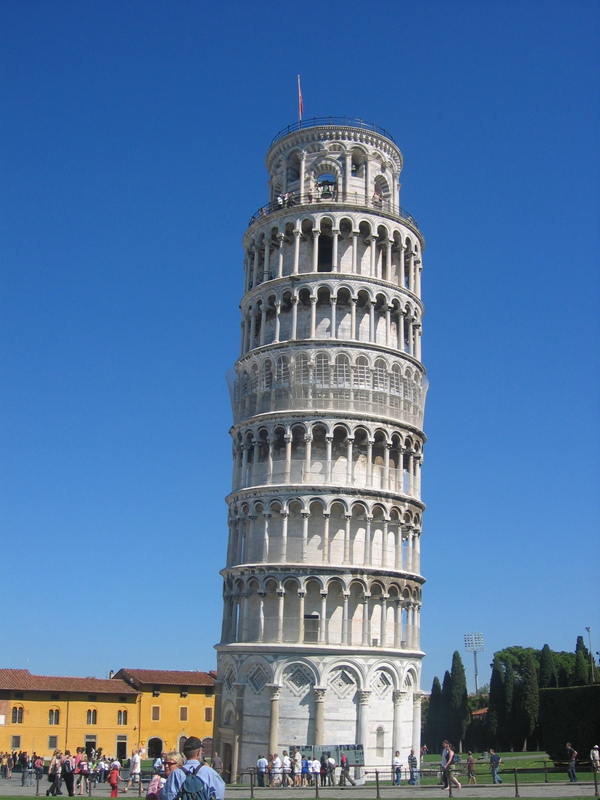 This entry was posted in Italy and tagged Florence, Italy, Leaning Tower of Pisa, Pisa, Rome.